AMD lovers, we hear ya. After building a killer Intel-based Windows 8.1 PC for $1000, we’re starting with a cheaper, more powerful AMD CPU this time around. And we won’t just walk you through the different steps in building a PC with AMD hardware—we’ll also determine whether an Intel processor or an AMD processor can give you a more powerful PC for the same budget. Let’s dive in! What does choosing AMD mean? Building a system around an AMD processor means making a couple of concessions. Although their performance is still very good, none of AMD’s current processors offer nearly the same IPC (instructions per clock) performance as Intel’s processors do. Clock for clock, or core for core, Intel’s processors simply offer better performance—at this time. Intel’s processors are also more power-efficient, though I doubt that most desktop users care much about a few watts here and there. Despite being the fastest APU in AMD’s lineup, the quad-core A10-6800K costs only about $140. On the flip side, choosing an AMD processor (and an accompanying AMD-compatible motherboard) will typically be less expensive. If you don’t intend to purchase a discrete graphics card and you hope to rely on integrated graphics, AMD’s current APUs (accelerated processing units) offer greater game compatibility, better driver support, and superior overall GPU performance versus Intel’s on-processor HD graphics products. To sum up: In general, AMD CPUs are less powerful and require slightly more juice than competing Intel CPUs do, but they offer better built-in graphics performance and usually come at a lower price. With my $1000 budget burning a hole in my pocket, I set out to choose parts that were roughly equivalent to those in the powerful Haswell-based PC I put together a few weeks back. 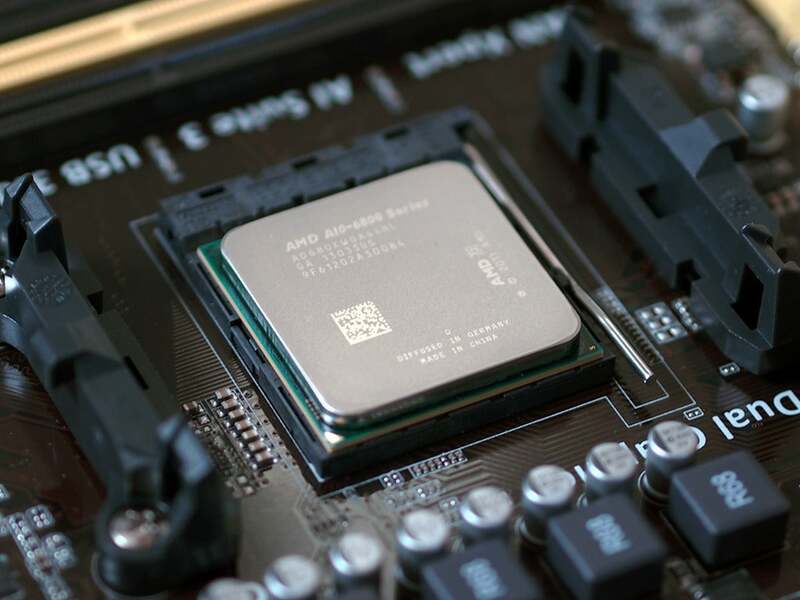 Selecting the right processor for this build is easy: AMD’s current top-of-the-line APU, the A10-6800K, is selling for only $140 as of this writing. With a 4.1GHz/4.4GHz base and boost frequencies, the A10-6800K is the best-performing quad-core APU in AMD’s lineup. It also offers better single-threaded performance than the majority of AMD’s processors do. Some of the beefier eight-core FX-Series products provide better multithreaded performance, but they cost more, use way more power, and require more expensive motherboards as well. Considering our dwindling budget and our goals with this build, the A10-6800K makes the most sense. The core of our AMD-based rig consists of an AMD A10-6800K APU, an Asus A88XM-A motherboard, 8GB of DDR3-2133 RAM, and a massive XFX Radeon R9 280X-based graphics card. Next I sought out the most affordable motherboard—from a reputable manufacturer—that also featured the proper FM2+ socket. I spied Asus’s A88XM-A in stock on Newegg for only $85, and snapped one up immediately. The A88XM-A is a micro-ATX motherboard, which limits expandability in comparison with its full-size ATX counterparts, but this build won’t require you fill all of its slots anyway. Plus, in my experience Asus does excellent work with motherboard BIOS/UEFI, and it offers stellar support for high-speed memory on AMD’s platforms. To achieve peak performance, you should pair your new AMD CPU with two sticks of dual-channel 2133MHz RAM. The most affordable option I could find was an 8GB kit from G.Skill for $82. The memory modules boast hefty heat-spreaders and a capacity high enough for all but the most demanding multitasking. More memory would be nice, but we’re on a budget. Now that the foundation of your PC is complete, the next step is to pick out some storage. For my build, to this point I’d spent about $307. Windows Pro 8.1 ate up another $140, bringing the total to $447. That left a little over $550 for the rest of the system, and I wanted to dedicate as much money as possible to a fantastic graphics card. A solid-state drive is one of the best ways to ensure high performance and a good user experience. As of this writing, Samsung’s 120GB 840 EVO drive, at about $101, is one of the more affordable, higher-performing SSDs around, so I picked it up. I paired that with a spacious, $55 1TB Western Digital Caviar Blue 7200-rpm hard drive for bulk storage, and I finished things off with a cheap DVD-R drive from Asus for a little less than $20. 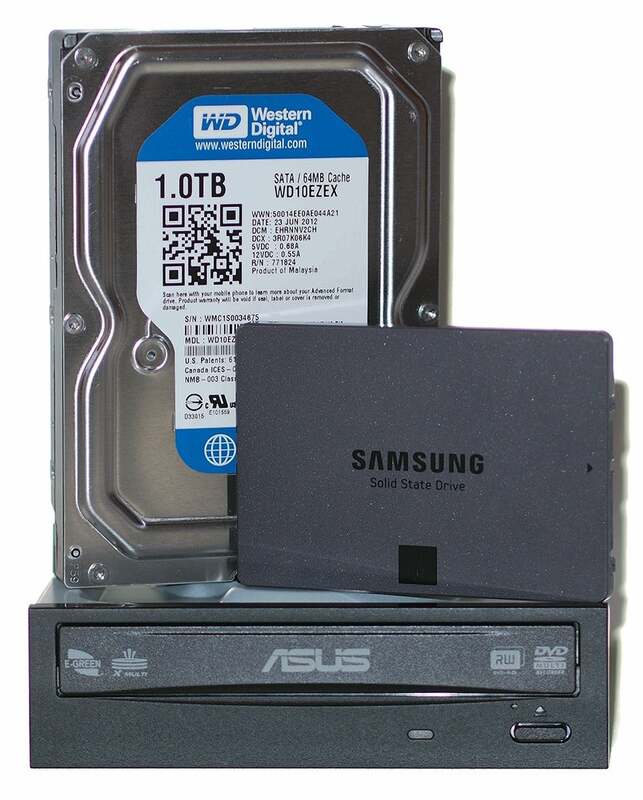 A fast Samsung solid-state drive, a spacious 1TB WD 7200-rpm hard drive, and an affordable Asus DVD-R optical drive are the pillars of this PC’s storage configuration. As with the other $1000 PC, I compromised a bit on the case and power supply. Normally I recommend a high-quality chassis and a PSU (power supply unit) from a respected brand name with a track record, to ensure an easy build and long-term stability. This time I didn’t have the budget to splurge, so I settled for an affordable case with a good-sized PSU. 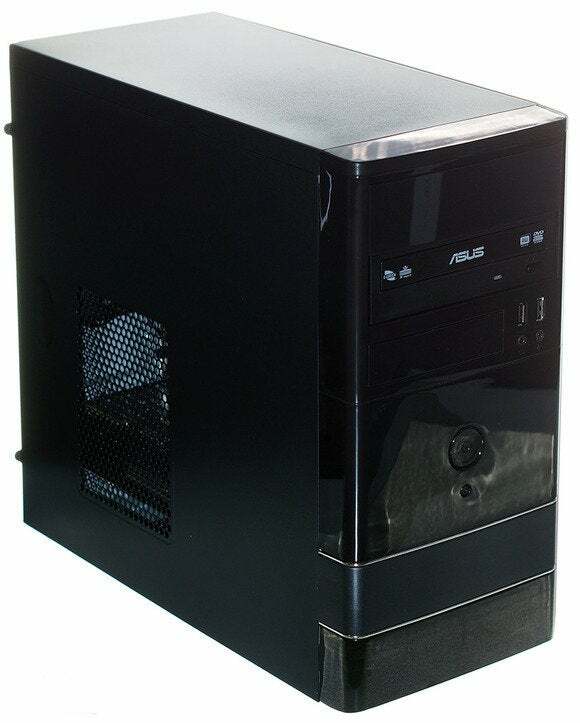 Rosewill’s $50 FBM-01-450P fit the bill: It’s a relatively attractive micro-ATX case that includes a 450-watt PSU. That’s a somewhat modest power capacity, but in light of the other components in this build, it should be plenty. With about $670 of the budget gone, I had enough cash left over for a relatively powerful GPU. I picked out an XFX Double D R9-280X-TDFD Radeon R9 280X card, which cost just under $310. Although it isn’t in the same class as one of Nvidia’s or AMD’s flagship cards, the Radeon R9 280X is still a powerhouse, and XFX’s custom, dual-fan cooler is nice and quiet. Saving money on the APU and motherboard allows you to use a larger portion of the budget on graphics, which should help to offset the performance difference between the A10-6800K and Intel’s pricier Core i5-4670 CPU with some workloads—mostly gaming. Here’s the complete breakdown of the parts and prices for this build. I won’t bore you with the minutiae and explain how each component connects where. If you follow the directions in the packages, it’s hard to screw anything up too badly. The biggest mistake to avoid is trying to force something into place where it’s not supposed to be. CPUs, memory sticks, SATA cables, graphics cards, and power connectors are all designed to fit in only one way. Stick to PCWorld’s PC-building best practices, and you shouldn’t have any trouble piecing together your new machine. The basic Rosewill FBM-01-450P chassis I chose for this build didn’t have any intelligent cable-management features, and its micro-ATX size made for some tight quarters. I ran into two minor issues: First, the power supply included with the Rosewill case had only a single, supplemental PCIe power lead. The Radeon R9 280X needs two. I had to adapt a pair of peripheral connectors to get the second lead necessary for the graphics card. XFX included one of the adapters right in the box, so it wasn’t a major problem. A bigger challenge was the fact that the case lacked intelligent cable-management features. It offered minimal room behind the motherboard tray—only a single cutout—and none of the PSU cables were modular. The micro-ATX case also gave me less room to work with than normal, so corralling all of the cables was a chore. The Windows 8.1 installation went without a hitch. And once the operating system was installed, I had to run only a single installer to take care of the AMD-based chipset and graphics card drivers. From start to finish, I went from blank drives to a fully functional Windows installation in under a half hour. For tips to ensure a smooth software installation, read through our best practices for setting up software on a new PC. After installing the OS and drivers, I immediately set out to benchmark the rig. If you remember my last Haswell build, you know that the system earned a score of 6516 in PCMark 7 and generated 30.81 frames per second in Crysis 3 with the game running at 1920 by 1080 pixels with high-quality settings and 4X antialiasing enabled. At similar settings, Bioshock Infinite ran at 64.72 fps. After a little tweaking and overclocking, however, the Haswell system’s frame rates in Crysis 3 increased by over 10 percent, to 34.46 fps, and in Bioshock Infinite it hit 67.97 fps. Those are pretty good numbers. But with no tweaking whatsoever, my newly built AMD rig managed a score of 5035 in PCMark 7, and its Crysis 3 frame rate reached 32.64 fps. Bioshock Infinite ran at 67.56 fps. The PCMark 7 score suggests that its overall system performance is lower than that of the Haswell-based PC, which you’d expect considering Intel’s CPU performance advantages. Gaming performance, however, was a bit better on the AMD rig thanks to the more powerful R9 280X. AMD makes overclocking the A10-6800K as simple as can be. With just a few clicks, AMD’s drivers will automatically find the APU’s highest stable overclock. 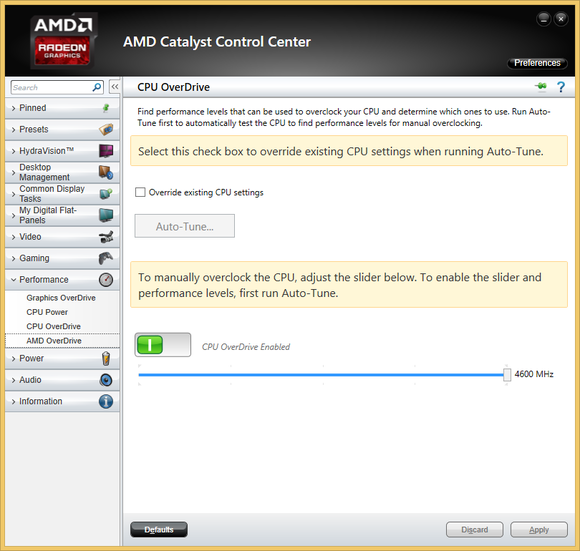 AMD makes boosting the performance of its APUs and graphics cards very easy, thanks to a few buttons and sliders in the Catalyst Control Center software’s performance menu. Users can overclock both the APU and GPU. Overclocking the APU is particularly simple because AMD automates the entire process. Just enable overdrive and click a single button, and CCC will try higher frequencies and test for stability along the way. With our setup, the automated tool was able to take the APU up to 4.6GHz. By moving a couple of sliders, I was also able to increase the frequencies on the GPU’s core and memory, from its stock frequencies of 1000MHz (GPU) and 1500MHz (memory) to 1080MHz and 1600MHz. In all likelihood I could have gone even higher, but power consumption increases sharply at the higher clock speeds, and I didn’t have that much faith in the power supply unit. Here’s what I mean: In my testing this PC idled at only 68 watts, and power consumption peaked at only 326 watts. After I overclocked it, though, power consumption shot up to 381 watts, which was about as close as I was comfortable getting to the power supply’s 450-watt rating. It’s not particularly flashy, but this AMD-based Windows 8.1 rig is affordable, and it put up some surprisingly good numbers—especially in my in-game tests. I reran the benchmark tests after overclocking this PC and saw its PCMark 7 score increase to 5154. Its Crysis 3 and Bioshock Infinite frame rates also increased, to 34.73 fps and 69.51 fps, respectively. I couldn’t beat the Haswell PC’s CPU speed advantages, but the faster GPU and overclocking gave the AMD system a clear advantage in the game tests. In the end, I’m very pleased with the performance of our AMD-based rig. Although its overall performance in day-to-day computing tasks isn’t quite as high as that of the similarly priced Haswell-based system, it’s still plenty fast. Plus, dedicating less money to the CPU and more to the GPU affords superior gaming performance.